Magic mushrooms produce auditory and visual hallucinations that some people seek out, but that are potentially dangerous. Also known as shrooms, the drug can produce a bad high if too much is taken. Psychedelic mushrooms are a particular type of mushrooms that contain the drug psilocybin which can lead to hallucinations and out of body experiences when consumed. The chemical complex of psilocybin is related to LSD though they are not the same exactly they are very similar in scope. Most people know psilocybin on the streets as mushrooms, magic mushrooms or shrooms. According to the New South Wales State Library, magic mushrooms are usually ingested to produce a powerful high that may include auditory and visual hallucinations, out of body experiences and a total body effect. 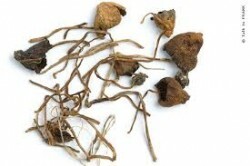 The mushrooms contain psilocybin which can be dried and stored for later use. Sometimes, psychedelic mushrooms are brewed into a tea or mixed with juice other times they are simply chewed and swallowed. Dosing levels are difficult to control because psychedelic mushrooms are not regulated and there is no simple way to know how much psilocybin is contained on a single mushroom cap. The average dose of psilocybin needed to produce a euphoric effect is about 5 milligrams but some users will take up to 10 milligrams at a time. Dosing is challenging at best due to the uncontrollable, natural levels of psilocybin that are found in the mushrooms which cannot be openly measured. Magic mushrooms are taken for their hallucinogenic effects, which can be dangerous. If you’re not a doctor, you have taken mushrooms before to get high or you simply don’t know what you’re doing then there are a number of potential risks associated with taking psychedelic mushrooms to get high. There are an estimated 200 different mushrooms that contain psilocybin and can produce euphoric effects when consumed but certain variations of these mushrooms are poisonous and other variations can be deadly. Picking a poisonous mushroom that looks like a psychedelic mushroom can cause deadly side effects if eaten. Psychedelic mushrooms that are rotten or which have spoiled are also dangerous for the user to eat. Mushrooms that grow mold on them can be toxic if consumed. Additional dangers surround the use of psychedelic mushrooms in the event that the user experiences a bad trip or bad high. Psilocybin can cause the user to experience a complete loss of reality that will induce severe anxiety and paranoia. The user can feel as if he or she is not himself and may experience severe hallucinations that can cause adverse side effects. Because there is a risk of a user taking magic mushrooms and experiencing a bad trip, there are no recommended safe levels of psilocybin that are considered accepted. Users who take psychedelic mushrooms should begin with a very low dose to prevent terrifying levels of anxiety and paranoia from occurring as a result of a bad trip. Studies estimate that taking anything more than 13 milligrams of psilocybin can be dangerous and will distort the perception of the user to a point in which a bad trip could possibly occur. This is not an overdose level as further studies have shown that a user would have to eat approximately 30 pounds of psychedelic mushrooms in order to overdose on psilocybin but any level over 13 milligrams could result in either a “good” or possibly a “bad” trip. Taking magic mushrooms regularly will not lead to compulsive drug seeking behavior or physical dependence like the dependence that ensues when taking other psychedelic drugs. This doesn’t mean that magic mushrooms are safe or that they should be regularly consumed as there are risks associated with taking psilocybin and having a bad trip. Tolerance, a common sign of addiction, does develop quickly when taking psilocybin but it is not evidence of addiction. People who take magic mushrooms rarely experience addiction the way that such is experienced when using drugs such as heroin, prescription drugs or marijuana. Unfortunately, magic mushrooms can trigger deeper problems with mental instability including anxiety, aggressive disorders and schizophrenia which often require further treatment following an extended period of mushroom use. Before taking psychedelic mushrooms, think about the long term consequences that can ensue from regular use of this naturally occurring substance. Aside from the dangers of poison or taking mushrooms that are bad, there are also substantial risks associated with long term mental illness and instability resulting from a bad trip. 10 Signs of Psychedelic Mushrooms Abuse - Here are some signs to help you figure out if you or a loved one has been abusing psychedelic mushrooms. 5 Potentially Dangerous Psilocybin Effects - Magic mushrooms, or mushrooms containing psilocybin, can be very dangerous. They distort perception to a very high degree which can lead to serious problems for users. Are Psychedelic Mushrooms Addictive? - Psychedelic mushroom abuse can lead to a variety of adverse symptoms, but it cannot lead to addiction. Are Psychedelic Mushrooms Addictive? - The effects of psychedelic mushrooms can last for a long time, making them less likely to be abused several times in a row. Are Psychedelic Mushrooms Effects Dangerous - Having heard of the notorious 'bad trip,' it can be easy to wonder if psychedelic mushrooms effects are dangerous.